Beyond Productions in association with Liberty Films. 1995. Created by: Michael Caulfield, Tony Cavanaugh, Simone North. Composer: Roger Mason. CD (ST) Columbia. 483965 2. 1996. 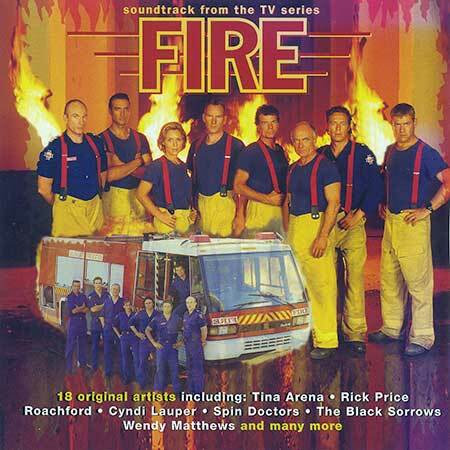 "SOUNDTRACK FROM THE TV SERIES FIRE." Little Miss Can’t Be Wrong. Spin Doctors. Better Times. The Black Sorrows. Lay Your Love on Me. Roachford. Sorrento Moon (I Remember). Tina Arena. Your Swaying Arms. Deacon Blue. Time After Time. Cyndi Lauper. I’ve Seen That Face Before (Libertango). Grace Jones. I Am What I See. Single Gun Theory. Funkify Yourself (Club Edit). Vision Four 5. What’s Wrong With That Girl? Rick Price.